Offering exceptional terrain for both mountain and road bikers, there's a trail for everybody in the Aspen area. Fill your water bottle and get after it! For 37 years, we know adventure. Our fully-supported 3-day ride takes you through Aspen, Carbondale, Glenwood Springs, the Maroon Bells and more. Amazing scenes all the way. Hire a local guide for mountain and road bike tours. Get the insider's info on the best rides in the valley by visiting any of the area's top-notch bike shops. Safety first means wearing a helmet and following the rules of the road and the trail. For maps and trail descriptions of hundreds of miles of bike terrain, visit Aspen Ranger District office at 806 W. Hallam, Aspen, CO 81611 or call (970) 925-3445. Nestled in the Roaring Fork River Valley, Aspen offers access to hundreds of miles of trails for mountain and road biking. Terrain, from technical to mellow, abounds for riders who are interested in touring through the scenic area on two wheels. White River National Forest and area ski resorts make single track trails as well as logging, mining and fire access roads available for mountain bikers. 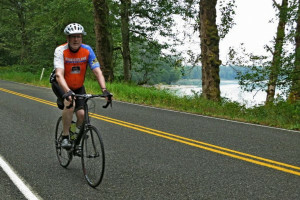 The vast scenic paved roads, stretching for miles past flower meadows and impressive mountains, are popular routes for the area's enthusiastic road cyclists. Aspen is home to bike shops with serious expertise, offering tune-ups, repair, rentals and guide services. It doesn't get much better than a bike ride in the Colorado summer sun. Rio Grande Trail: Named for the old railroad line whose tracks it follows, this 19-mile trail, located north of town, takes a ride from Aspen to Emma with an easy grade, perfect for novice riders who want a good work out. Owl Creek Trail: Starting at Buttermilk Ski Area, this less-than-5-mile trail connects the town of Aspen with Snowmass Village with some moderate elevation gain to get your blood pumping. Hunter Valley Trail: Paralleling Hunter Creek, this trail, with public parking at lower and upper access points, is a favorite among local riders and connects to numerous trail systems, including Woody Creek and Midway Creek Trails. In Aspen, head north on Mill Street and bear left at Red Mountain Road. For access to lower trailhead, take next right at Lone Pine Road after bridge crossing, and following signs for parking on the left. For upper access, follow Red Mountain Road about a mile and take a right onto Hunter Creek Road. About a half mile further you should see signs for parking. 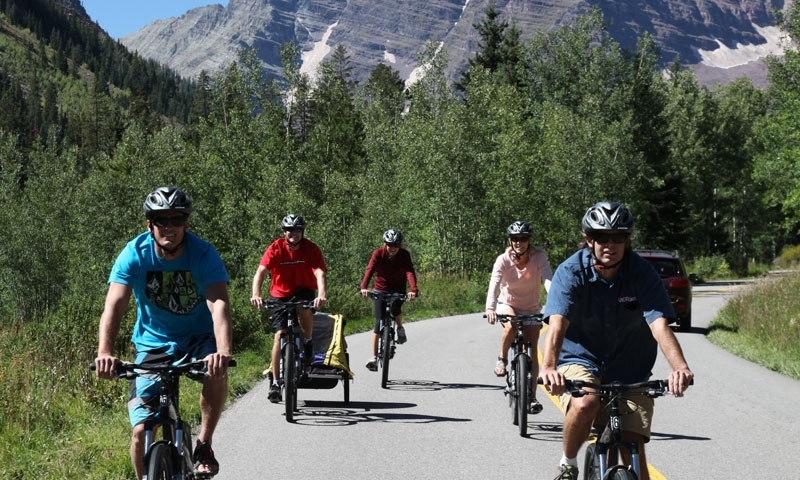 Ski Resorts, including Buttermilk, Aspen Meadows and Snowmass, all maintain bike trails on their downhill ski terrain, during the summer season. Visit their Web sites for more information. Maroon Creek Road: From mid-June to September, this road, which leads to the popular Maroon Bells Wilderness Area, is closed to all motorized traffic except shuttle buses, making it an especially enjoyable ride for bikers. From the Roundabout just west of town on Highway 82, turn on to Maroon Creek Road and ride 10 miles to Maroon Lake. Fees may be associated with lift/gondola access to some resort trails. Trails located on National Forest land are free and open to the public. Local shops rent everything from full suspension mountain bikes to road bikes to kids trailers for rates that range from $10/hour to $90/day. For under $100, you can experience a guided tour of what the Aspen valley has to offer. Guided rides are perfect for those who may be new to the sport or who are interested in getting the lay of the land from a local professional. Check out the local bike shops for detailed maps of trails and terrain, for advice on the best rides and for all your gear needs. The Buena Vista Bike Fest is an annual bicycle race that begins in Buena Vista and ends in Leadville.